Russell Finex has been selected to represent the manufacturing and services industry in the 2017/2018 Parliamentary Review. The publication, seen as a template of best practice across 20 key sectors, reaches over 60,000 of the UK's leading Chief Executives, Ministers and journalists. Contributions to this edition come from some of the most high-profile names in politics. Prime Minister Theresa May introduces the Manufacturing Edition, whilst Stephen Phipson CBE, Chief Executive of EEF and Andrew Neil, the highly-regarded political journalist, provide forewords. As part of his foreword, Phipson cites the UK's "strength as a manufacturing and innovation trailblazer," and continues to explore the expected effects of Brexit on the manufacturing industry, stating, "for UK companies to flourish post-Brexit, we need and want a bespoke trade arrangement between the UK and EU to become a reality." The manufacturing sector has always been an anchor for UK growth, as it leads the way in terms of innovation and best practice. On many occasions, Russell Finex has led the way in terms of innovation in separation technology, introducing inventions and filing patents, and the company is often consulted when new industry standards are introduced. Russell Finex, a global leader in the manufacture of premium industrial sieving and filtration equipment, has enjoyed almost 85 years of steady growth, and continues to evolve its product line and manufacturing methods. The Parliamentary Review highlights key factors in the success of Russell Finex, as an example of how manufacturers, as well as businesses in other sectors, can structure sustainable growth. Its unique ownership structure, the employee benefit trust, is seen as playing a significant role in allowing a stable working environment, and the making of longer-term business decisions rather than short-term gains. A non-contributory final salary pension scheme is also seen as evidence of stability. This secure platform has allowed the company to grow, even during hard economic times. One of the greatest challenges faced has been success itself, with production demands increasing more than predicted. This has led to the implementation of methods such as lean manufacturing, allowing the business to manage growth spurts with minimal impact. The company has also invested in a wealth of new manufacturing technology to uphold the quality of its products whilst output is increased. Business values of organic growth and premium products are embedded throughout Russell Finex. This has meant the ability to maintain a strong global customer base, as the business has expanded. Customers are involved in new product development, and significant investment is made in R&D programmes, ensuring a status as market leaders is upheld. A recent example of this can be found with the Russell AMPro Sieve Station™ - a revolutionary additive manufacturing powder handling system designed specifically to support the growth of the 3D printing industry. 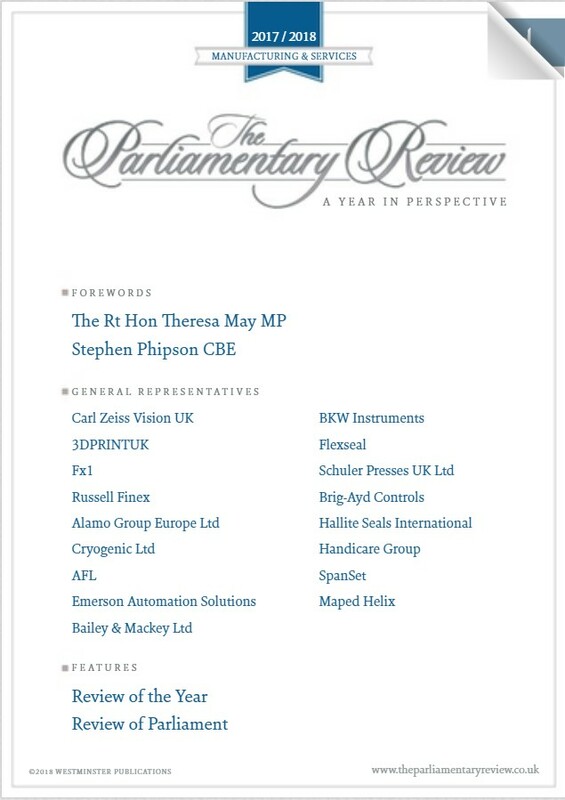 To find out more about why Russell Finex was selected as an example of best practice for the manufacturing industry, read the Parliamentary Review Manufacturing & Services Edition. Russell Finex can be found on page 23.